UPDATE - 10 Aug 16: OMG! We have a video tutorial! Thank you Nadia of YARNutopia! UPDATE - 14 Aug 12: NOW WITH CHART!! The fabulous Isabelle (FilACroche on Ravelry) set about making a chart for her own use - clever girl! - and then very generously allowed me to post it here for everyone! UPDATE - 17 May 12: Having trouble with the RVS in round 7? Try the "longhand" version posted here. UPDATE - 29 May 11: a schematic for rounds 1 and 2 has been added - the stitches are shown "flat" for clarity but you'll be working in the round. I hope it helps with that fiddly round 2! 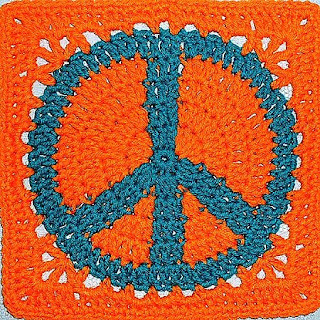 Some time back a member of Crochet Partners posted that she was looking for a peace symbol granny square pattern. Somehow it caught my imagination, and this was the result. Seeing the picture of it now, I think the square would benefit from a wider border, but at the time I was just trying to knock something up quickly to fill a need. It came out 10" for me (I crochet loosely) but it would be a simple thing to add rounds to bring it up to any size you like. Reverse V-stitch: work 2dctog, skipping 1 st btw first and second dc. Click here for more details. Changing colours: with last 2 loops of dc still on hook, drop first colour and complete stitch with second colour. Carry colours across the back of the work, catching under a stitch if they get a bit long, or work completely over them throughout. With A: Ch 4 and join to form a ring (or use a Magic Ring). Rnd 1) ch 1, work 12 sc in ring, join with slst in FL of beg sc. Copyright © 2008, Judy M Kerr. All Rights Reserved. Errors? Problems? Please email me. If you do try this pattern I'd love to see pictures! ETA: See an afghan made with this square here. That is *great*!!! Awesome job! The design is so crisp; it just works so well. Thank you Sus! It was just one of those "Ooo, must try that right now!" moments, LOL. BTW, did you that Ravelry has a link to your snowflake pattern? I found out when I was listing the snowflakes I'd made from online patterns. Well, thank you very much Patti! Great idea - I hope we'll see a picture. Wow! This looks like a great pattern. Did you think it was challenging when changing colors? That part sounds a little confusing. Thank you! It was fun working it out. The pattern is a bit of a brain-ache, though - sorry. But it's really just Rnd 2. The reason for the FL's and BL's is to keep the three stitches of each "arm" of the symbol parallel so that the arms are straight and not angling out from the centre. The good news is, once you get past that round the rest are just ordinary dc's and the colour changes are obvious. You change colors... um... at the end of the last stich or during the stich it tells you to change color? Hi Erica! Yes, you change colour before you finish the dc, while you've still got the last two loops on your hook. That way you get a nice, smooth transition from one colour to the next. If you were to finish the stitch and then changed colour, the top "v" threads of your dc would be the wrong colour. I'm so glad I found you. My granddaughter would love this. I'm glad you found me, too! :-) I'd love to see what you make with it. Yes, go for it, absolutely. :-) I'm so pleased you considered it. What a marvelous opportunity for your daughter. How long will she be there? Good luck with your fundraising. I hope my little square goes some way towards achieving your goal. Let me know if you have any problems with the pattern. The second round is a bit of a bear, LOL, but after that it should be straightforward. LOL! For such enthusiasm I wish I could accommodate you. But I don't have a webcam or a video recorder and I've never done anything like that. I know the 2nd round is very fiddly (I might be able to work out some sort of photo tutorial for that bit; I'll have to give it some thought) but once you're past that bit the rest is pretty easy. I would like to make this afghan for my daughter but I have no idea how much yarn I should buy. I've not made an afghan with this pattern but I always allow about 1200g/42oz for a single size. I just checked a couple of the afghans on Ravelry - one person used 6 skeins of Red Heart Super Saver (just under 42oz) and another used 10 different colours but I don't think she used all the yarn. This is fantastic... My niece is into peace symbols at the moment and for Christmas all my nieces are getting crocheted bags. It took me two days to find it, but your pattern will be perfect for my oldest niece's bag! Thank you. I think it will all be good.. just having issues because I'm using a chenille yarn from Lion Brand for the peace sign area. It can be difficult to see the stitches lol. I put up pics of my work on the Lion Brand site.. hope you won't mind if I do and add a link to your blog. Happy Holidays! Thanks for the great pattern! Perfect my peace lovin' 9 y.o. DD. I've posted and linked on Ravelry. I'm one of the Editors at http://www.allfreecrochetafghanpatterns.com/ and I just wanted to let you know I have linked to your project on our site. 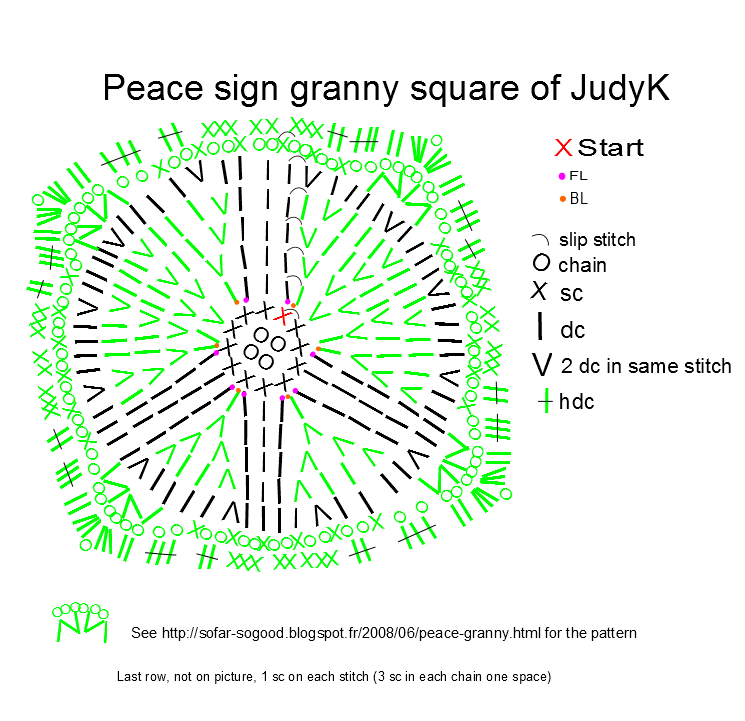 You can see the project and thumbnail at: http://www.allfreecrochetafghanpatterns.com/Granny-Square/Peace-Sign-Granny-Square. I think it's a great project that our readers will just love to make. This will easily bring traffic to your site and allow others to see what's new on your site. We would love to add more of your projects to our site, so feel free to let us know as you add or create projects. We are always looking for afghan projects as well as other projects so if you have any of these please feel free to send them my way or let us know if you prefer we not link to you. We also feature projects from our website on our blogs, eBooks and e-mail newsletters. Your project is great and we know our readers will enjoy it. With that said, can we have permission to link to any project on your site as well as use the image? We will credit you, of course. I love your pattern! I love the black strips between the blocks and would like the pattern for how you finished the afghan, please. Very cute peace sign granny square, hope I can make it look like yours. I'm also looking for a Marijuana leaf granny square, 6 or 7 inch would be just perfect. I haven't had any luck finding any thing that small. Any ideas? I need it for a fund raiser, to help buy a seizure dog for a lady that is on medical marijuana. I also need to make marijuana leaf coasters. Any ideas or help, I would be very greatful. My e-mail is jpudvay@yahoo.com & Thank-you for readind this. Had a guy tell me that if I could make him a scarf with a peace sign he would buy if for his wife. I goggled and found yours. Love it. I made a scarf and a hat with it. He was thrilled and so was his wife. She wants me to make more things for her now. I did change your pattern up a bit to fill my needs though. Just made a afghan from your pattern! thank you so much for sharing. I can't figure out the reverse v stitch. Could you please explain that more? Thank you! i LOVE this pattern! it would be so awesome for what im makeing! but i just dont understand it! you make a ring, do the 12 sc in the ring, dc and then change colors? how?! when do you add color B? i really want this to work out but i cant understanf it! and you keep the color on the hook? huh! lol im sooo lost help! Hi Yesi, I'm glad you like the pattern. You don't have any contact details so I'm hoping you come back to check for posts here. There is a section on changing colours at the beginning of the pattern, although it does assume some experience of basic crochet. And I hope the schematic will give a clearer indication of where and when to change colours. This was the first granny square I ever tried to make. I recently shared the pattern with my little sister and remembered the (woeful) attempt I made. However, taught me a lot lol, so danke for posting this. I can't wait to do this for my granddaughter. Thanks for sharing my daughter loves peace signs can't wait to make something with this motif....Love it! Hola Ofelia! Gracias por su interés en el patrón. Creo que no soy capaz de hacer buenas fotografías de las puntadas. En ronda 2, son demasiado juntos. El gráfico por Isabelle es muy bueno. ¿Usted puede utilizarlo? This is beautiful. Just to be sure, I'm carrying the contrasting color from arm to arm rather than breaking off and weaving in? I'd love to send you a picture of our finished afghan we made with this wonderful pattern, where could I email it to? And I'd love to see it, Mands! Please send it to sofar_sogood at btinternet dot com. I'd like to make an afghan using your pattern but I wonder if you have any idea on how much yarn I'd need. It would be good to know before I shop for the yarn. I’m afraid I don’t know how much yarn an afghan would require. I’ve only ever made a few individual squares. That said, I had a look on Ravelry at the afghans others have made with the pattern to see if any of them listed the amount used. Three did, but it’s a bit confusing, LOL! One made a 54-square afghan that, according to the totals they listed, required roughly 56.7 yards of yarn per square. Another made 20 squares and supposedly used 107.2 per square. And the third made 12 squares and used 30.3. Not much consistency there, I’m afraid. If you could bring yourself to do it, I’d suggest working one square and then taking it apart again and measuring how much yarn it took. Thank you for sharing this! I'm having trouble making the color change from B to A at the slip stitch and chain three (at end/beginning of each row) look nice and smooth and crisp. Any suggestions? Kelly, are you swapping back to A for the last half of the final B stitch? Just as you do for the other colour changes - that will keep the change "crisp". If that's not the issue, email me: sofar_sogood at btinternet dot com. ben de denedim örneği güzel oldu ama ipleri nereye saklayacağız ? 1 made it but there is a little problem how we can change colour ? Are you asking what to do with the loose threads on the back? yes ,actually that ı mean in the centre the thread gets too long do you have piture about back side ? Has anyone, by chance, made a tutorial on this? I really want to make it for my gf but I am such a clutz and need visuals. I have only be hooking for a couple of months but am determined. Anyone able to create youtube video and post it on behalf of the designer? Hugs ladies. What is the diameter of the only peace sign in inches? Thanks! Hey H&C, I took the above measurement from one I have on hand for questions, but I found one that I'd made before and blocked and the peace sign part is actually 7 1/2 inches across. I'm gonna try peace sign! Wish me luck!! I'm a lefty and pretty duh at it!! Lol!! Tku!! If I ever figure it out I'll share! Tku again!! Go for it Donna! I've recently had another lefty contact me about this pattern, so you're not alone. Hey, Judy! Left hander chiming in! Your peace sign is still alive and well on the internet! After I got the initial peace sign done, I had major problems with rows 7 & 8. I finally figured then out, only to finish with the peace sign being crooked. Those rows aren't symmetrical, and lefties need that in written patterns, or their work comes out weird. I've downloaded the green image, and reversed it. I'll send pics once I get the second one done. M Houghton, LOL! That was a good idea. One you've probably had to employ many times. I'll have to remember to flag non-symmetrical rounds in future. Thanks for bringing it to my attention. OK, i got it straightened. In Row 7, the "sc in beg of ch 3 of previous round, ch 2, (sk st, sc in nxt st, ch 2) x3" (meaning 4 sets, right?) i changed it to 3 sets. came out perfect. Where can i send you the comparison pix? I made one square to put into an afghan,made of all sorts of blocks. When my roommate saw it she said; "Wouldn't a whole string of these look great? ".....so now I am making a Peace Bunting! love the block Thank you! LOL! Thank you @sadiesamie. You *have* been busy! I'm glad the video was helpful and so grateful to Nadia for making it. Thank you so much for sharing the Peace symbol. I was a teen in the late 60's- 70's so this is just so prominent from them. Never was a hippie how ever with the war going on then it made an impact to the times. My brother & husband were fighting the war then. Dear Dawn, You're very welcome! I'm glad it has meaning for you. I can quite understand not embracing the counterculture when you have loved ones fighting in the war at the time. I was only 10 in 1970, so I missed the whole hippie thing. What was going on when I was a teen? Punk rock. I did NOT sign up for that, LOL! I’m a 50-something (when did THAT happen??) crochet crazy, tarot hugging, internet addict. I live in Harwich, Essex with Hubby and three beautiful cats. ETA: now four beautiful cats - we've been adopted, LOL! 17/11/14 Three again. :( Sleep well, little Sasha. 24/5/16 Now only two. We'll miss you, Tinkle. 5/8/16 And then there was one. Bye bye Blue, my favourite furry fella. Free Easy Small - only 19.5KB!